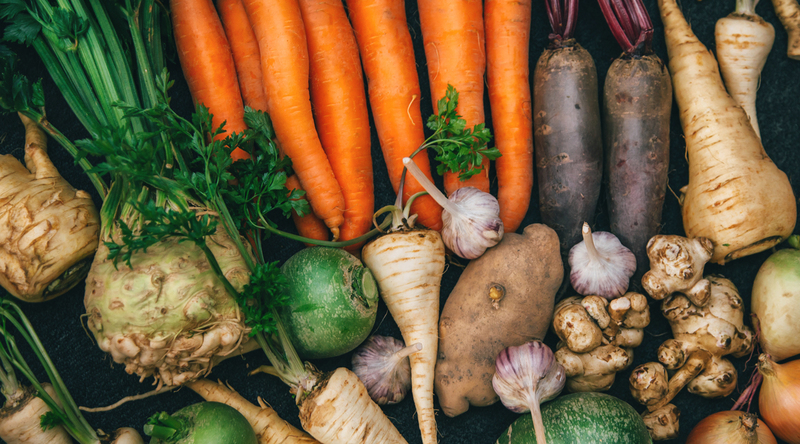 Carrots, potatoes, onions: these cooking staples are the common players we think of as ‘root vegetables.’ In truth, any edible plant part that grows underground counts as a root vegetable, opening up a wide world of inexpensive and tasty root veggies to enjoy! Because roots act as the storage organs for a plant’s resources, these hearty vegetables are chock full of nutrition. Many are used by plants to store carbohydrates, making them starchy and healthful alternatives to processed carbs like pasta or bread. We’ve crafted five plant-based root vegetable stews featuring both familiar and less common (but still readily available) root vegetables, with a focus on dishing up comforting fall flavors. If you thought you couldn’t enjoy the taste of Buffalo wings or artichoke dip in a plant-based, whole food option, try these recipes and you’ll think again! 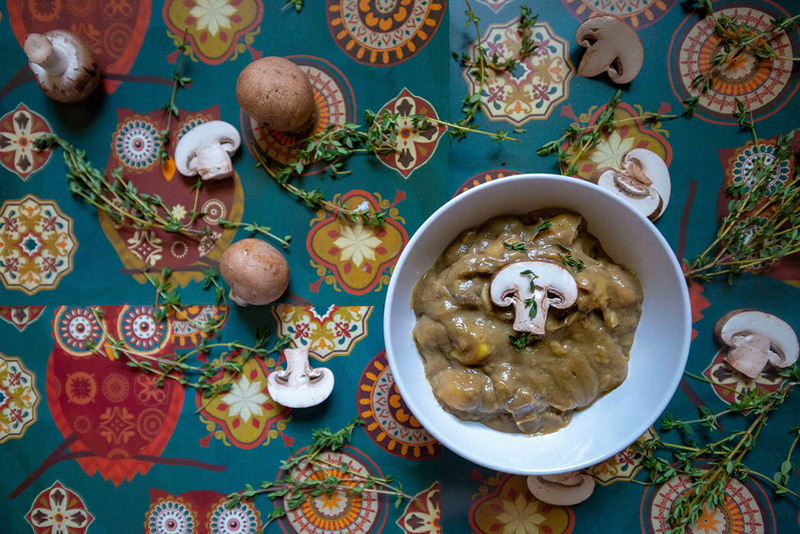 Cream of mushroom soup is a kitchen mainstay for casseroles, but it’s even better when elevated into a main dish as a vegetable stew. Parsnips are a sweet, creamy, and too-often overlooked ingredient. They look like white carrots, and mash similarly to potatoes. Like carrots and potatoes, they’re available year-round, though they’re most prolific in fall and winter. Parsnips contain lots of potassium, as well as Vitamins C and E. If you can’t find them at your local grocery store, you can substitute white sweet potatoes. The mushrooms used here were a mix of button and cremini, but feel free to use either one. No matter which you choose, mushrooms offer B vitamins and immune-boosting selenium. 1. Add olive oil to a pot over medium-high heat. 2. Saute mushrooms and garlic for 2 to 3 minutes. 3. Add all remaining ingredients and bring to a boil. 4. Reduce heat to medium-low and simmer until vegetables are cooked through, about 20 minutes. 5. Mash with a potato masher, or for a creamier result, remove 1/3 of stew and blend, then return to pot and mix with remainder. Once served from a can and topped with marshmallows, the humble sweet potato has come a long way, and is now rightly featured as a fresh ingredient in many dishes. Available in a variety of colors, including white, yellow, orange, and purple, and sometimes called a yam, this tuber is as naturally sweet as its name implies. Orange and yellow varieties have the softest and most dessert-like flesh, while white and purple are on the starchier side — with a texture more like a Russet potato. All varieties are available throughout the year. 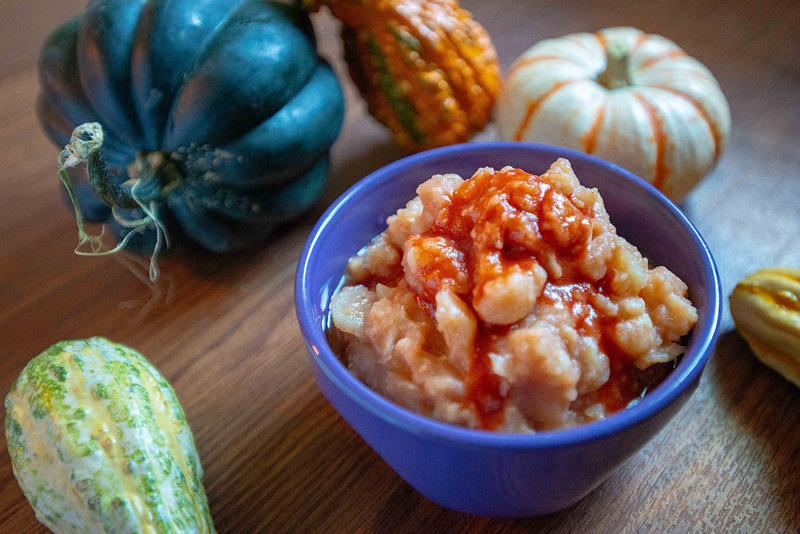 Through the addition of coconut milk, which has metabolism-boosting MCTs; anti-inflammatory ginger; and blood-sugar-stabilizing cinnamon, this stew brings the flavors of that classic, gooey-sweet side dish in a way that feels like an indulgence but isn’t. 1. Add all ingredients except garnish to a large pot and turn heat to high. 2. Bring to a boil, then reduce to a simmer and cook until sweet potatoes and tender, about 15 minutes. 3. Remove ginger (if using fresh) and mash stew lightly with a potato masher until about half of sweet potatoes are broken down (for a creamier result, remove 2 cups of stew, blend, and return to the pot). Garnish with pecans and cinnamon before serving. If there’s one veggie that’s taken over restaurant menus and the home-cooking internet like no other, it’s cauliflower. It’s got a neutral white color, mild taste, and good nutrition with very few calories. Frying and saucing cauliflower in the style of Buffalo wings is a popular use, but not exactly the healthiest option. Here we use it in a stew with celery root, which is also known as celeriac. Celery root is not, as its name would suggest, the root of the celery vegetable, although they’re related. If you’ve never tried it before, you’ll find that celery root has a richness and a nuanced flavor that belies its strange appearance. It’s available year-round, but most available in cold months. If you can’t find celery root at your grocery store, you can substitute yellow potatoes. 1. Bring celery root and broth to a boil in a pot over medium high heat. 2. Reduce heat to medium and boil gently for five minutes. 3. Add cauliflower and boil gently for additional 10 minutes. 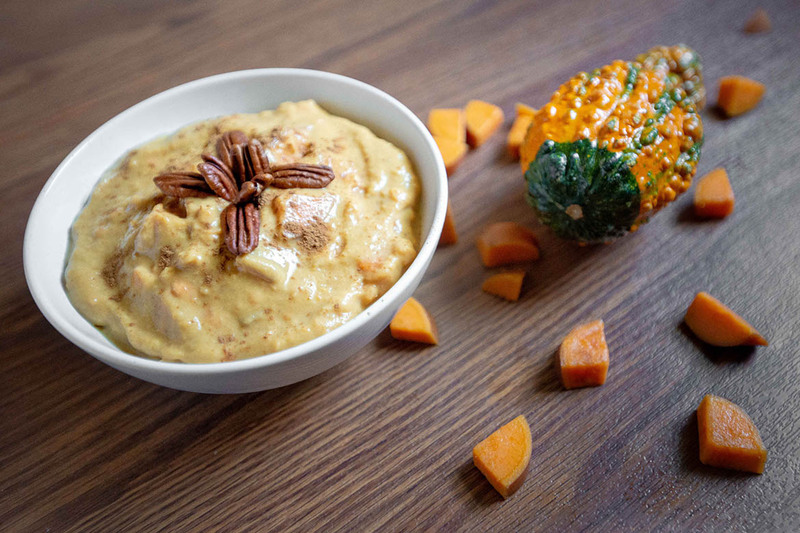 How can a mayonnaise-laden, junk-foody, game day dip possibly become a healthful, plant-based stew? More easily than you’d think! The main flavor in artichoke dip is the artichoke itself, and the creaminess can be replaced with better options than mayonnaise or even vegan mayo. Enter sunchokes, also known as Jerusalem artichokes. 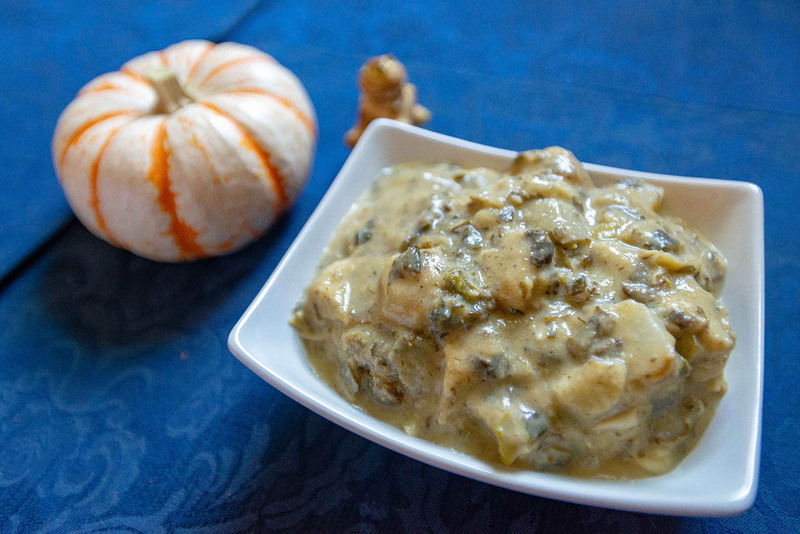 This a fall/winter tuber tastes like the love child of an artichoke and a potato, and they lend creamy texture, artichokey flavor, and a ton of prebiotic fiber — which feeds the healthy probiotic in your digestive system. (If sunchokes aren’t available, you can substitute white potatoes). Using nutritional yeast to bring butteriness to the dish, removes any need for butter or margarine. 1. Bring sunchokes, broth, dill, salt and pepper to a boil in a covered, medium-size pot; reduce to a simmer. 2. Cook for five minutes, then add artichoke hearts and continue to simmer, covered, for five minutes longer. 3. Turn off heat, remove one-third of the stew and blend, return to the pot and stir. 4. Add cream cheese, spinach and nutritional yeast; stir until incorporated. Also known as boeuf bourguignon, the classic beef stew made with red wine is reimagined here with its signature flavors using plant-based ingredients. Root vegetables including potatoes, carrots, onions and garlic keep their place as the veg combo, along with the traditional rosemary, but the beef is swapped out for jackfruit. When jackfruit is used unripe (which is how it’s sold in cans), this antioxidant-rich fruit has a texture similar to cooked meat, and easily takes on the flavors of whatever you cook it in. As the weather cools and cold/flu season begins, eating more sulfur-rich vegetables like onions and garlic is a simple way to help boost your immunity. 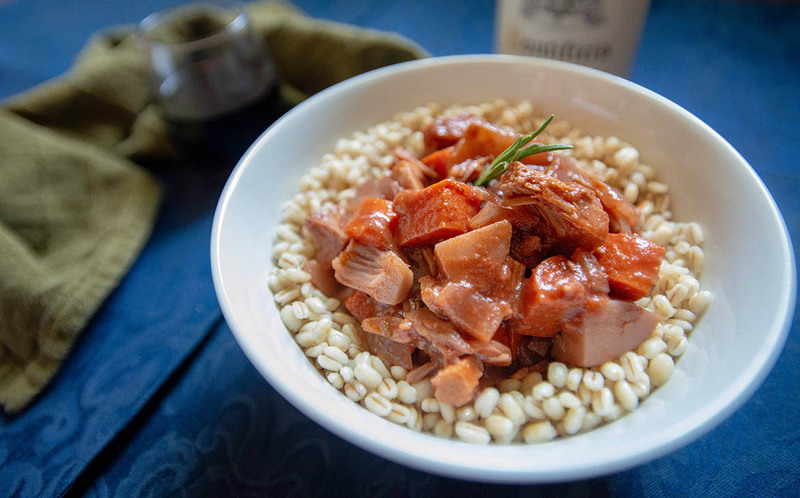 “Beef” stew that’s better for the planet and helps fight a cold — who knew dinner could do so much good?! Burgundy stew is typically served over egg noodles. Here we paired it instead with barley, a sustainable grain that is drought-resistant and reduces weeds and pests in soil. 2. Saute onion for 10 minutes, until golden at edges. 3. Add garlic, flour, and tomato purée; stir to combine, making sure flour is not clumped. 4. Add all remaining ingredients and bring to a boil. 5. Reduce heat to medium and boil gently until vegetables are cooked through, about 30 minutes. 6. Serve by spooning over barley or other grain of choice. Looking for more recipe inspiration, support and success stories? Check out the OMD book!